Welcome to Swim Fit Camp! 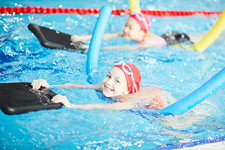 Our Swim Fit Camp is designed for the child that wants to get active, improve their swimming and learn more about their health and wellness in fun and interactive week of activities and fitness classes such as track and field, yoga, Zumba and sports. Children will have the opportunity to participate in Red Cross Swimming Lessons, attend fitness classes as well as nutritional lessons. Children will be challenged to improve their overall health in a fun interactive environment. Swim lessons will be led by a Red Cross Certified Instructor. Campers will be in the pool for a maximum of 1 hour per day.